WASHINGTON — The U.S. Navy is getting larger and adding an extra ship to its fleet in 2019, over its 2018 request, but the total shipbuilding budget request seems to make little headway toward a 355-ship fleet called for in a review last year. The Navy’s base budget request is $151.4 billion, with $15 billion in overseas contingency operations funding split with the Marine Corps. The total Department of the Navy budget request is $194.1 billion, including OCO. Overall, the budget request represents a 7 percent bump over fiscal 2018, according to budget documents provided by the Navy. The service is asking for $21.9 billion for shipbuilding with a total of 10 ships, just one more than the nine requested in 2018. That number includes plans to buy two Virginia-class attack submarines, three Flight III Arleigh Burke destroyers and a single littoral combat ship. The Navy plans to stop buying littoral combat ships and start buying the FFG(X) in 2020, according to the future-year defense planning projections in the budget request. The Navy does plan to be close to 300 ships by the end of 2019, up from 280 ships as of Feb. 12, 2017, according to the Navy’s website. Much of the growth will come from littoral combat ships coming online. The service is also planning to maintain its pace of buying an aircraft carrier every five years, with a carrier slated for 2023 in the future-year defense planning projections, or FYDP. The Navy is also planning to add sailors to its ranks, asking for a plus-up of about 7,500 sailors over last year’s request, setting 2019 end strength at 335,400. The Navy plans to continue to grow end strength through 2023, projecting growth of 344,800. For aircraft, the Navy is asking for $19 billion, a figure which includes 24 F/A-18 Super Hornets in 2019 and has another 86 planned for the FYDP. The Navy is planning to buy nine F-35Cs and the Marine Corps plans to pick up another 20 of the vertical-launch F-35Bs in 2019. The Navy’s buying strategy for the F-35C picks up in 2020 with 16 slated for purchase and then 24 every year from 2021 through 2023 for a total of 97 in the FYDP. Procurement of the MQ-25 Stingray, an aerial unmanned tanker currently in development, is slated to begin in 2023, the last year of the FYDP. The Navy also plans to keep its foot on the gas with the Virginia-class fast-attack submarine program, which includes two of the subs in 2019, the year the Navy plans to buy the first Columbia-class. 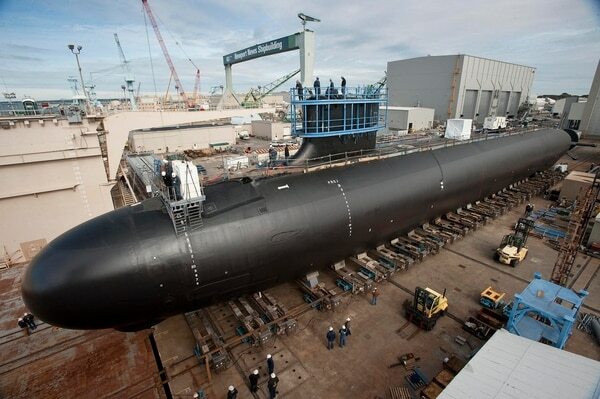 The Columbia-class sub is destined to replace the Ohio-class ballistic missile submarine. The Navy had been calling for maintaining the pace of two Virginians per year, even on years they plan to buy the Columbia-class boats — a departure from the service’s last 30-year shipbuilding plan. In the weapons category, the Navy is planning to buy eight of the new over-the-horizon weapons for the littoral combat ship in 2019, with a total of 64 planned in the FYDP. That missile is widely expected to be the Raytheon-Kongsberg Naval Strike Missile. A decision will likely be announced this summer. The path to reaching a 355-ship Navy seems all but clear. The Navy plans to keep up the pace with the SM-6 missile, planning for 125 of them per year through the next five years. The budget also plans for 45 Evolved Seasparrow Missiles, with a total of 705 through the FYDP. On the aviation side, the Navy plans to buy 25 long-range anti-surface missiles in 2019, with a total of 75 in the FYDP. There are none planned after 2021. The plan also calls for 75 joint air-to-ground missiles with 838 total in the FYDP. The Navy is investing $705 million in research and development for the Columbia-class submarine. For the Navy’s future frigate, the budget requests $135 million, which the Navy says is needed for a “reassessment” of the capabilities needed. Funding will support warfare systems engineering, design and planning efforts. The Navy’s total operations and maintenance funding is set at $41.4 billion, a drop from FY18 but still up from the last Obama budget, which asked for $38.2 billion. The oft-shafted military construction budget for the Navy and Marine Corps is up from $1.8 billion to $2.5 billion.